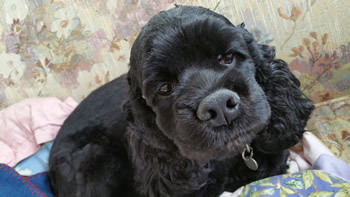 Morticia [Adoption Pending] is a tiny shiny black two-year old cocker just shy of 20 pounds. She has a jolly little gait and has an adorable little howl. She loves to wake up early and have an early breakfast, a romp in the yard with her foster dog buddies, and then snuggle up tightly next to you while you have your coffee. 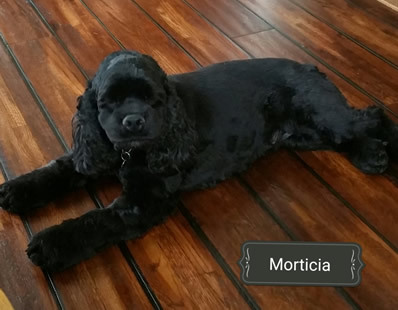 Morticia is quiet, sweet, and is just starting to show her mischievous side. So far, she has dug some secret holes in the yard and nibbled up the edges of several quilts. She will need plenty of gentle redirection and lots of soft chew toys. Morticia warms up to women quickly, but a slightly a little more cautious with men, but with time, she does eventually get comfortable. She likes children, as long as they are gentle and speak with kind voices. She is an easy walker and doesn't pull on her leash. She is still very nervous when out and about in the world and will need lots of patience when she goes to her new home and preferably a fenced yard, because she still is a little tentative about coming when called. Morticia would also love a home with another dog, she really likes to play chase with other dogs and likes their company. She is housetrained, as long as she has a consistent schedule and a few reminders. She can use a dog door, but doesn't like to be outside unless there is a person out with her. She is crate trained, but likes to be near people. Her favorite activity is snuggling with you while gently nibbling at your fingers.